'Doxie.' 'Dachsie.' 'Weiner Dog.' 'Hot Dog.' There are lots of nicknames for these long, little, and likable dogs. But the true name is Dachshund (pronounced Docks-hund), which means 'badger hound' in German where the breed developed to hunt its namesake rodent. The low-riding dog is a lively, intelligent fellow with a keen sense of smell. There are two recognized sizes for the breed—standard and miniature. Dachshunds have rambunctious, playful personalities, and love being near their favorite person. Though they are little, they are courageous and adventurous. Dachshunds are also called Doxies, Dachsies, Weiner Dogs, Hot Dogs, Sausage Dogs, and Badger Dogs. 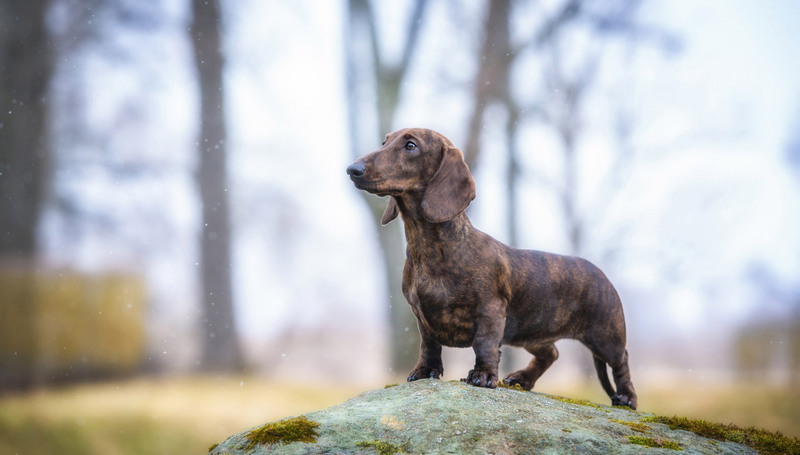 Dachshund mixes are a highly common mixed breed available from shelters and rescues, possibly as a result of the breed's frequent back problems or outsized bark. Dachshund mixes will resemble the other breeds in their ancestry, but often have the short legs and long body of the Doxie. The majority of shelters do not perform DNA testing on their rescues, so heritage is usually determined based on physical traits, temperament, and any information shared by the person surrendering the dog. To ensure there is some Dachshund in your mixed breed dog, locate a shelter that does genetic testing on mixed breeds, or a specialty rescue that focuses on AKC-registered Dachshunds and Dachshund mixes. Common Dachshund mixes include Chihuahua, Pomeranian, Labrador, Golden Retriever, and Pug. Coat - Dachshunds have three types of coats: smooth (short coat), wirehaired, and longhaired. Smooth coats should be short and shiny, and not too thick or long. Wirehaired coats have a thick, rough and short outercoat, with a soft undercoat. Longhaired coats are shiny, sleek and often a little wavy, with longer hair on the neck, chest, and underside. Colors, which can be solid or mixed, include red, cream, black, chocolate, gray, and fawn. Dachshunds should have a long, low trunk with short legs and muscular build. The Dachsund carries his head high, and has a confident, alert, intelligent facial expression. He has a long snout that tapers evenly, and expressive, almond-shaped eyes. His tail continues straight from his spine without much curving. He has muscular forequarters that allow him to dig and follow his prey underground. His stride is fluid and smooth, and he is agile in his movements. Dachshunds date back to the 15th century. A cross between terriers and hounds, they were developed in Germany to hunt their quarry by digging into badgers' underground burrows. Early in the breed's formal history, dogs weighing between 30 and 35 pounds were also used to hunt wild boar, and dogs between 16 and 22 pounds were used to hunt foxes and rabbits. Dachshunds were imported to the United States in the late 1800s when the first references appeared in The American Kennel Club Stud Book. Pablo Picasso and Andy Warhol both owned and loved Dachshunds, who inspired sketches and paintings. Dachshunds are determined and courageous little dogs. They are very clever, which can be seen in their intelligent, expressive eyes. They have a tendency to bark at people walking near their house or squirrels in the yard. They often become attached to a single person in their family, though they will be friendly and playful with everyone in the household. They tend to be a reserved or shy around strangers, with miniature varieties the most timid. Dachshunds also have a stubborn streak. Are Dachshunds Good with Kids? Dachshunds are generally well behaved around children who are members of their own family, but adult supervision is always recommended. They are gentle for the most part, but they may lose patience and snarl or snap at children who are too rough or don't recognize the signals the dog is finished playing. Are Dachshunds Good with Other Pets? Dachshunds are comfortable with other pets they've known since they were young, not so with animals they don't know well. Socializing your Dachsie with people and animals will help improve their comfort around strange pets. Always supervise them when introduced to pets they don't know. Dachies are highly protective of their family and their territory. They will bark aggressively and incessantly when they perceive a threat. Are Dachshunds Good Guard Dogs? Alert, protective Dachshunds keep a close lookout for anyone encroaching on their territory. A visit from the mail carrier or a friend will always elicit barking. Consider them more your watchdog than your guard dog. Dachshunds have moderate energy levels. They are active and spirited. They will 'help' you around the house, investigating whatever you are doing. Can be protective of their family if they sense a threat. They may bark at strangers and unfamiliar dogs. The Dachsund bark is surprisingly loud. With their long backs and short legs, Dachshunds are prone to back injuries. They should be prevented from jumping down from furniture or gaining weight, which can cause ruptured or slipped discs. Dog stairs protect Dachshunds from injuring their backs jumping off furniture. Their intelligence means they are easily bored and need to be kept busy to prevent destructive behaviors. They are slow to housetrain and may require crate training. Indoor Dachshunds enjoy time outside, but they are indoor dogs. Aside from the occasional barking, the breed is a good choice for apartment living. They like to romp and play inside, in between sitting on your lap. Consider crate training your Dachshund because they are slow to housetrain and engage in destructive behaviors when bored. Outdoor Dachshunds like a game of fetch in the backyard, but they aren't robust enough to spend extended stretches of time outside. Their badger hunting instincts may also inspire them to dig holes in the yard. In winter, your Dachshund likely needs a dog jacket when outside for more than a few minutes. Exercise Dachshunds require moderate levels of exercise. Several 10-minute walks per day in addition to a boisterous game of catch will keep them at a healthy weight and physically fit. Endurance These hunting dogs have a plenty of stamina. They will keep up with you on your walks and have energy left over for playtime inside. Running Miles: Dachshunds can run for short distances. Because of their short legs, they are not distance runners. Hiking Miles: A healthy Dachshund can join you on a hike for one or two miles over easy terrain. Food Depending on their size and age, Dachshunds can eat between ½ and 1 ½ cups of high-quality dry dog food each day over the course of several meals. Watch your Dachshund for signs of weight gain, which can exacerbate back problems. Alone Time Dachshunds can spend several hours alone before requiring a walk to go to the bathroom and exercise. If left alone for more than a few hours, these smart dogs can become bored and get into trouble. Give them plenty of dog toys to hunt, or a puzzle dog toy to work on while you're away. Crate training Dachsies can also keep them out of mischief. Dachshunds are low-maintenance dogs. The smooth and wirehaired varieties should be brushed several days per week, while the longhaired variety should be brushed every day to prevent matting. They are moderate shedders and require only occasional bathing, unless they follow a badger into a burrow. How to Pick up a Dachshund? Because of their high risk for back injuries, it's important to pick up and hold a Dachshund so their back is supported the entire time. When picking up a Dachsie, place one hand under their chest behind their forelegs, and the other around their rump. When you lift, be careful to keep their back as even as possible. Support the length of their back the whole time you hold them. When you set them down, hold them in the same position you lifted them. Never lift a Dachshund up from behind the front legs and let them dangle without supporting their lower back. Dachshunds can be difficult to housetrain and their stubbornness can make training slow-going. But they are highly intelligent dogs, and with patience, persistence, and short training sessions, they'll learn what they need to know. Agility training is an excellent way to challenge your smart Dachshund. Make the training sessions short and reward your Dachsie with praise and dog treats and he'll look forward to learning the ropes. With their short legs and back problems, however, agility courses for Dachshunds should not include jumping. Though they were bred to hunt, few Dachshunds are used for sporting today. But there are enthusiasts who appreciate the dog for its mix of terrier and hound qualities that enable the breed to both track down and chase prey that have gone to ground. Many Dachshund owners train them for Earthdog trials. These are non-competitive events that test the natural and learned underground hunting skills of Dachshunds and small terriers. The training and trials involve 'hunting' rats safely inside cages that are placed within manmade burrows. No. Dachshunds shed and, as a result, release pet dander into your home. Dander is the cause of most pet-related allergies. Are Dachshunds better in pairs? All dogs are social animals and Dachshunds often worked in pairs when chasing their quarry. So, the company of another Dachshie or any breed dog is usually a quality of life improvement for these dogs. However, because they are wary of newcomers, they should be socialized with their buddies from an early age if possible. No. They aren't mean. But they do tend to gravitate towards one favorite human, which can make others feel shortchanged of Dachsie snuggles. Many of them will also bark impolitely and at length at human and four-legged strangers. Dachshunds are not good swimmers because of their short legs. They can learn to swim for short periods of time, but it's best to keep your Dachshund on dry land and keep a close eye on him when near bodies of water.